Dr. Eric Lee has been named the new president & CEO of the Colorado Black Chamber of Commerce. He begins work at the Chamber on April 20th. Lee succeeds former Denver Mayor Wellington Webb who served as interim president and chief executive officer for 18 months. Webb will return to the Board as Chairman. Prior to joining the Chamber, Lee served as the Assistant to the President at Suffolk University, where he was a member of the President’s Executive Cabinet. Lee advised the President on matters related to institutional research, information technology, strategic planning, and institutional diversity. Lee also taught financial management and fund-raising courses at the Sawyer Business School. 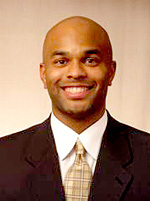 Previously selected as one of the “30 Emerging Leaders under 30” by Ebony Magazine and one of the “20 Nebraska Leaders under 40” by the Lincoln Journal Star Newspaper, Lee earned his Bachelor of Science and Master’s degree from Wayne State College (NE), and Ph.D. from the University of Nebraska. I am mosted pleased to see the Colorado Black Chamber of Commerce is creating sustainabilty for it's memembership. Although I am from the old school when family, neighbors, friends and community created the nucleus requried for business success, as a specialist in small business start-ups and from my experience in my work with Micro Lending financing, I find this an area in which the "Chamber" could seek to enhance assistance of the flame of entrepreneurship in members of the black commumity. As we talk about the decline of urban areas such as Historic Five Points, the perfect blueprint for small busiess, I am not seeing the focus in the asset base we as community members already have. It takes many facets for a successful business, including the difinition of success. Perhaps we can support the start-ups and and let the Corporate Alliances make it on their own. I find it interesting that there is no mention of the job Dr. Lee held after Suffolk University. He worked briefly at Lesley University in Cambridge, MA and was reportedly let go.